Thanks for the various suggestions regarding maps and s/w folks. After two days mucking around with this, in amongst doing a few other things, I have come to the conclusion that it was far from a waste of money! I have installed a black wallpaper on the off chance that it will use less power than a "pretty" coloured one. Time will tell. The standard Google keyboard is better than the Touchpal one I use on my Android phone. The provided browser is also better than Firefox for mobiles that I use on my phone. Importantly, I can type passwords far faster and with greater accuracy than I can on the phone. It is in no danger of replacing my laptop, but can sit on the seat in sleep mode and be woken up nearly instantly. It also fits in the glovebox of Roo2 ... . It works fine using my phone as a mobile WiFi Internet access point. There is no provision for a SIM card, so cannot be used as a phone, or without a phone for roaming Internet access. All in all, far better and faster than I expected it to be. As far as I know the black wallpaper technique only works if the tablet has the feature where if it senses black pixels, it just turns them off. Them brands advertise this feature as "true black". That's why I will just have to see if it has any effect. Maybe, maybe not ... . I have just installed Malwarebytes. That caused me to uninstall Firefox! Ugly. The pre-installed browser is absolutely clean! I have no idea what it is. Yeah the aldi tablets are great! Been using my aldi lifetab for a few years now, just died! Think it's the battery or power circuit so should be an easy fix. I think I've identified the preinstalled browser. Methinks it is a basic version of Quick ICS Browser. I've just installed the above on my phone, so will compare notes. Hahahaha, been spending a bit too much time with the geeks over on Ozfoz! The banana pi is a new generation of micro computers, basically cheap and reliable computers that can run almost anything. Here is the setup I am hoping to run, with the screen going either in the cubby hole bellow the AC control or in the dash. 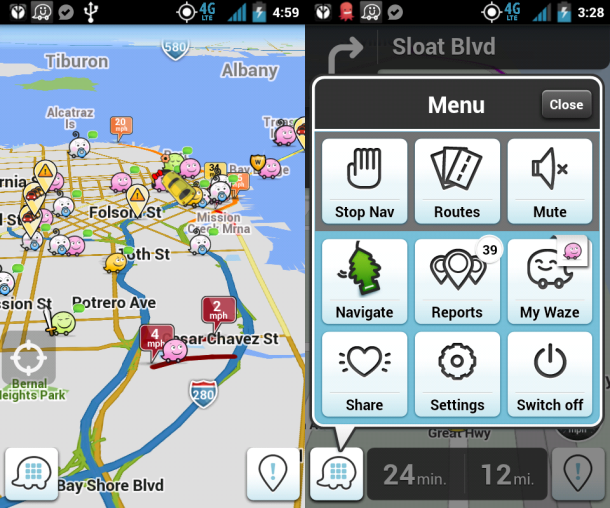 Waze is an awesome android app, I recommend you download it. The simplest way to explain it is "Social naviagation". It basically work the same as any other GPS app, but has a community aspect. What is does is allows people to mark the locations of accidents, traffic jams, and Mobile speed cameras, which is extremely handy for long freeway runs. It also has other cool stuff, like fuel prices and sharing locations with friends. Torque is a good app to install if you have a bluetooth or wifi OBD2 reader, basically turns your tablet or phone into a ECU datalogger and allows you to read any Check engine light codes etc. Just what are you guyz talking about....????????? ^ Alternate uses for tablet computers. Discovered today. The Aldi Onix tablet doesn't have a GPS receiver! Both previous models had this feature. I have read about Bad Elf. Simpler to return this. It's all but impossible to buy a tablet without GPSR! Officeworks guarantee that the HP 10 has it. What this experience has taught me is that one doesn't need the latest, flashest, most expensive unit for this purpose. Just has to have GPSR, and fit in the glovebox, out of sight ... .